I was trying to buy clothes for my one year old son in india, and I was going to through various online portal for kids. As usual i started my search with google and i was hoping to find some kid only store. Here is what google threw at me 1) Amazon.com 2) Jabong.com 3) Snapdeal.com None of the these are kids only destinations. firstcry, which is kids only store, showed at number 5 position in google search results. Increasingly Google has started showing strong preference for big brands, and even for niche categories such as kids clothing google is showing results from amazon and flipkart. What does this mean for small retailers such as firstcry, babyoye or any other similar service? First cry and babyoye are reasonably well funded and still they don’t show in google search for their category related keywords. This means building online niche business is going to be increasingly difficult. Then what are your options if you want to setup a niche online kids clothing store. First of all you have to decide your marketing channel, this can’t be google. if you are setting up an online store then you can’t rely on organic traffic initially because showing up in organic searches will take time. You will have to give up on adwords model as well because you would find Amazon and flipkart there as well. With their deep pockets they are going to jack up the keyword prices. If I were owner of one such venture here is what i would do? 1) Explore offline routes- can we open offline store? Lenskart has already gone that route Amazon and flipkart are definitely not interested in offline stores at least for the time being. 2) Promote through online affiliate channels. Can you tie up discount sites such as retailmenot or coupons monk and offer great deal through them? Discount sites have lots of traffic, audience which has low loyalty and therefore will be willing to try your site as well. But you will have to offer very good deal. 3) You could also look at the catalog’s of big e-tailers and offer products which they don’t offer right now. This is a short term strategy because ultimately big retailer are going to start selling those products as well. 4) Can you create you own branded products? Zovi in india is following this strategy but building an brand is not easy. It requires lots of upfront investment. Competing with big e-tailer is not easy. You have think through your strategy very carefully. Anyone who has tried to go shopping for anything will tell how challenging it can really be but when it comes to buying children’s clothes, it is one completely different affair. Today’s kids are very selective and they are knowledgeable in matters of fashion and style. Gone are days when mom and dad walked to the shop and the kids would be satisfied with everything that was brought home. Kids today know the most popular brands and labels and as we all know, these don’t come with a small price tag. Buy off season: One of the best ways to enjoy great deals is to always ensure that you buy your clothes out of season. Most companies and stores usually want to clear their inventory in order to create room for newer products. This is the reason why they usually have huge sales; this means that summer clothes will be up to 75% cheaper during winter and vice versa. If you are going to buy sweaters, you are better off buying them during summer and your children’s swimsuits are better off bought during winter. Plan ahead: If you are going to get nice deals you will need to ensure that you buy kid’s clothes at leastsix months before they need them. You also need to be careful to see how much your child will have grown in those six months so that you buy stuff that is slightly bigger. This is sometimes a little bit easier for those people who have older children because smaller kids experience growth spurts ever once in a while. You may want to take to other parents who have children so that they tell you what kind of growth children experience at a certain age so that you get things right. The internet is also full of sites that have this kind of information and you can also find books that have growth charts that you can interrogate. Be careful on style: When you buy clothes early and off season, it should not be lost on you that kids also have a sense of style. Today’s kids are picky and they will decide what to wear or not wear; you don’t want to make a huge saving only to realize that your child will be throwing tantrums every time you want them to wear it. The best way to achieve this is to go along with them so that they approve what you are going to buy for them. Children are more likely to wear styles, designs and colors they participated in choosing because they will have a sense of ownership. These may look like they are simple steps but you can be sure that they will get you big deals when buying stuff for your kids anytime. Nowadays buyers are at the ruling seat to decide which products or brands to buy. In other words, the world has transformed into a consumer driven market. Now a day’s consumer is king. Even big enterprises are now running on their toes to provide quality products at competitive price. Many strategies are employed to give incredible advantages to customers while encouraging them to buy suitable products in the most convenient manner. At present there are endless companies trying to sell their products online so that you do not have to move from store to store to shop for your little ones. Now shopping for your little ones has become very easy, all you need to do is log on to internet and start searching with a click of button. 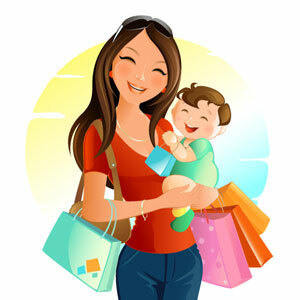 Within a fraction of a second you can get access to relevant brands, range of products at different prices which in a way help customers shop baby clothes online instantly and effectively. BabyGap is one of the popular brands preferred by new mothers for their toddlers and older babies. At Carter you can get highly supple, cuddly and wonderfully crafted and imprinted clothes for new born. The company also manufactures variety of playwear for toddlers. Gymboree is another popular name when it comes to shopping for small babies. The exclusive product range and special offers introduced for product promotion make Gymboree one of the popular brands among new moms. For shopping economically one can opt for brands such as, Old Navy to obtain trendy baby clothing. In addition to this there are other exciting brands like Hanna Andersson, Little Me, Janie and Jack, Spider Man, Tom and Jerry and many more. In case, the ordered material and the consignment differ in color, specification or size, you can easily get your money refunded by reliable site owners. All you have to do is to study the whole return policy and then send the parcel with a return-shipping-tag. The retailers will notify you through an e-mail as to when your refund will be made. However you should keep in mind that you can return your order within approximately 30-45 days of your purchase as the return policies differ from company to company. Make sure you get all the information from the website itself. It is obvious that online shopping is a great way to save money and energy. It is becoming a popular habit among shopaholics across the world. The wonderful part of shopping baby cloths online is obtaining free coupons that make the entire buying process more economical. Most companies provide online shopping coupons for baby clothes during festival or holiday season. Hence, before buying, one should check the marketing company’s website to get information on any ongoing offer or checkout the deals sites mentioned above. Doing this one can make enormous savings shopping online.